The nocturnal walk home through Lagos would take him up to two hours, after he had played all night at the West End Coliseum, a popular nightclub on Lagos Island. After trekking the 1,640-foot-long Carter Bridge across the lagoon back to the mainland, he would take a break for some window shopping at Bhojsons. This Indian-owned store used to be the place where well-to-do Lagosians bought their wedding gifts. Nowadays the shop windows that once showcased watches and jewelry are bricked shut, as Bhojsons sells motorbikes and tricycles in a showroom that vaguely smells of the dried crayfish sold at the adjacent Oyingbo market. From Bhojsons, the musician would stroll down the rail track all the way to his rented room in Mushin, some three miles north. It was the mid-1960s and the young man, Sunday Ishola Adeniyi Adegeye, still an unknown artist, could not afford the cab fare home. Today, 69 and long known as King Sunny Adé, he is a wealthy man and one of Nigeria’s most famous musicians. He became the worldwide icon of juju, the Yoruba praise music driven by the rhythm of the talking drum accompanied by Hawaiian-style guitar. After gaining local popularity during the ’70s oil boom, when the Lagos elite invited Sunny Adé and His African Beats to spice up their parties, he started touring internationally in the 1980s, having been called “The New Bob Marley” by his agents. He was nominated for a Grammy twice, but never broke through on the world stage. Among world-music lovers, however, his fame is substantial. Sunny Adé, who grew up in Osogbo in Osun State, went to Lagos in 1963 to be a musician, after lying to his mother that he had been accepted to a university there. The metropolis on the Atlantic became his home, and his career prospered. The juju superstar is not much in the public eye anymore. 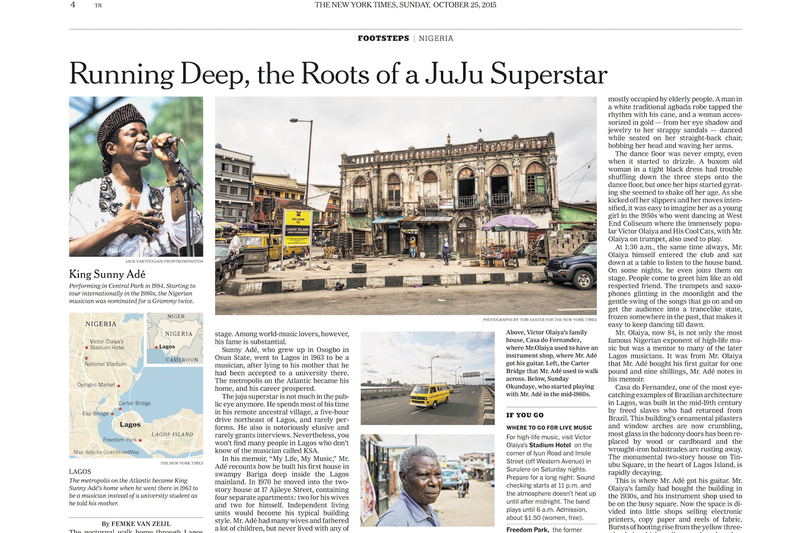 He spends most of his time in his remote ancestral village, a five-hour drive northeast of Lagos, and rarely performs. He also is notoriously elusive and rarely grants interviews. Nevertheless, you won’t find many people in Lagos who don’t know of the musician called KSA. In his memoir, “My Life, My Music,” Mr. Adé recounts how he built his first house in swampy Bariga deep inside the Lagos mainland. In 1970 he moved into the two-story house at 17 Ajileye Street, containing four separate apartments: two for his wives and two for himself. Independent living units would become his typical building style. Mr. Adé had many wives and fathered a lot of children, but never lived with any of them.